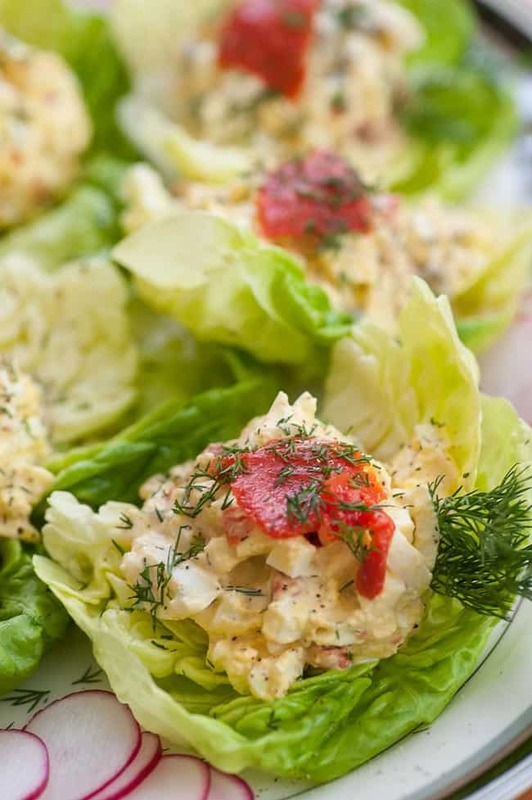 Here’s a great tasting lunch/brunch idea…smoked salmon egg salad lettuce wrap. The flavor blend in this dish is amazing. I really love smoked salmon, especially the cold smoked kind. It is sold in small packages of 3 or 4 ounces and is a little pricey. The package I bought was around $5.00 for 3 ounces. The thing about it though, is that you get so much flavor out of the salmon and it easily flavors anything it’s blended with. 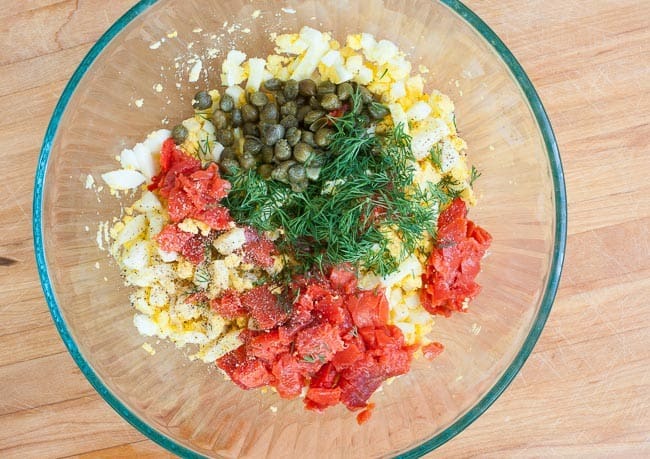 In this case it is added to an egg salad with dill and capers and the salmon flavor easily shines through. You should also check out my recipe for creamy scrambled eggs with smoked salmon. Did I say I love smoked salmon? First off though…the hard cooked eggs. We received an electric Crock Pot pressure cooker , (affiliate link), for Christmas, (just like an Instant Pot), and use it constantly. I read somewhere that if you cook eggs in the pressure cooker, the shells are much easier to get off. One of my pet peeves are egg shells that are hard to remove and you end up ripping the egg white. Take a look at the photo above and look how there are hemispheres of egg shells. These were incredibly easy to peel and it was 8 minutes in the pressure cooker. And you can pressure cook as many eggs as fit into the pot and the time would be the same. Anyone thinking easy deviled eggs? Here’s a shot of most of the ingredients used in smoked salmon egg salad lettuce wrap. You’ll notice I’ve got a handy dandy egg slicer to chop up the eggs. If you don’t have one of these you can do a coarse chop with a paring knife, then finish up by smashing the eggs with a fork. A pastry cutter works well too. I used Boston lettuce for this, but romaine, bibb, or butter lettuce would also be a good choice. Just depends on what your market carries. I used a #16 ice cream scoop to plop the egg salad onto the lettuce, reserved some extra salmon chunks for a garnish, and then added a bit more chopped dill. This made a delicious lunch meal. The simple recipe is below. 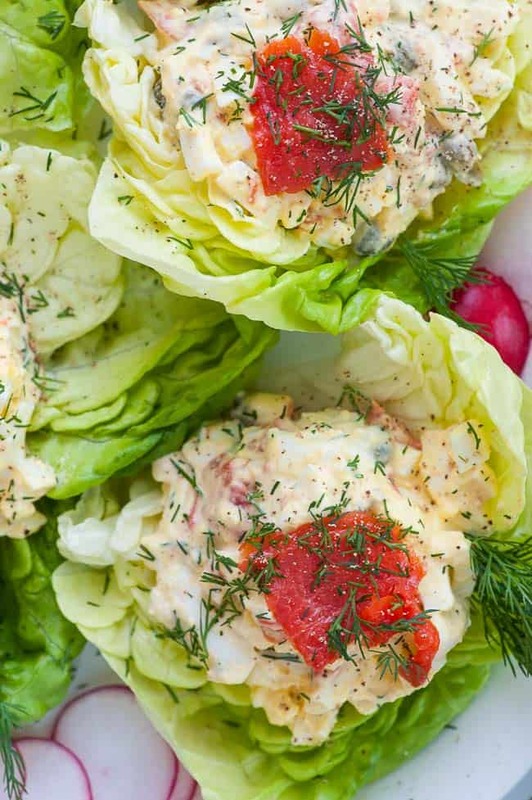 Disclaimer: This recipe post for smoked salmon egg salad lettuce wrap contains an affiliate link which means Joe’s Healthy Meals will receive a commission on sales through this link. Tasty salad that's easy to make. 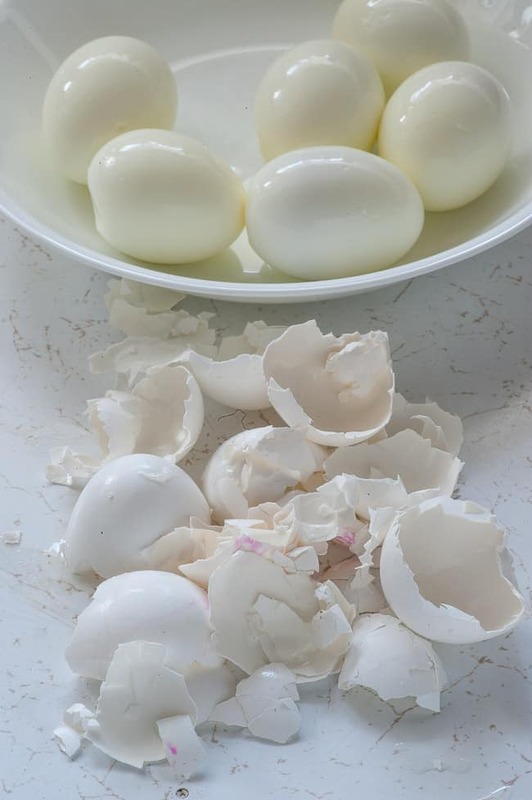 Chop hard boiled eggs into a large bowl using an egg slicer, pastry cutter or other tool. Chop smoked salmon into small pieces, reserving 6 larger pieces for garnish, if desired. 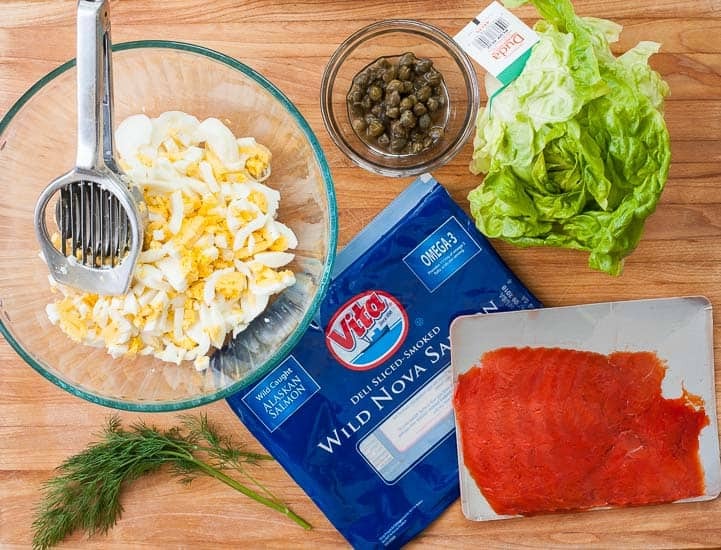 Add the salmon, dill, capers, mayonnaise and pepper and fold together. Taste and add salt if needed. 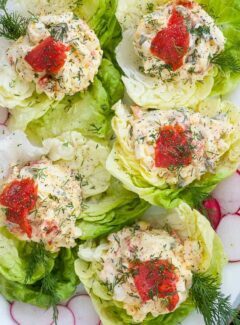 Place 1/4 cup of salad, (#16 scoop), on each lettuce leaf and garnish with additional salmon and dill. 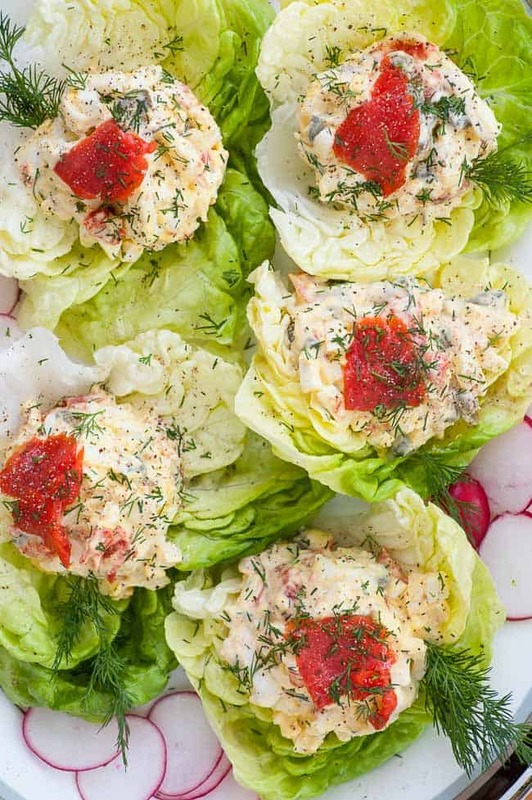 I love all of the ingredients in this recipe, so putting them together makes an excellent lunch (or appetizer). I can practically taste the salmon just from looking at the photos! 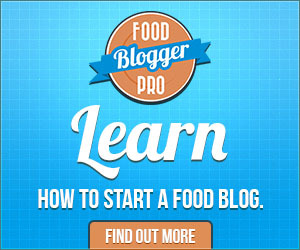 I will definitely be making this recipe.